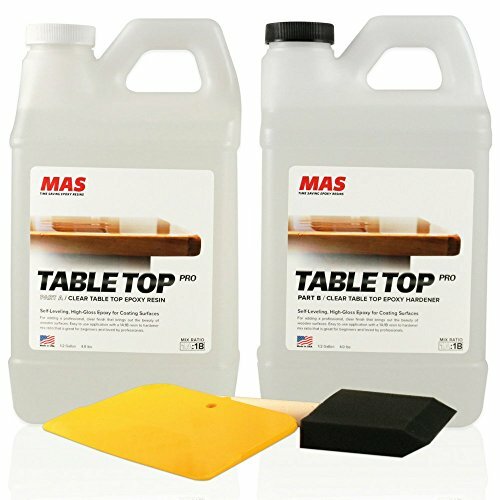 Thank you for your interest in TableTop Pro by MAS Epoxies! Q: How much does 1 gallon cover? A: As a rule of thumb, 1 gallon kit covers 12 sq ft with an 1/8" coating. This just an approximation. The exact amounts vary from project to project based on a number of factors (surface material, application type, etc). Q: How do I apply? Does it de-gas by itself or do I have to torch out the bubbles? INCLUDES SPREADER & BRUSH: Our 1:1 kit includes 1/2 gallon of Part A (resin), half gallon of Part B (hardener), a 4" spreader, and a 4" brush. If you have any questions about this product by MAS Epoxies, contact us by completing and submitting the form below. If you are looking for a specif part number, please include it with your message.